Still thinking about Christmas gift ideas, for yourself or others? Here are a few ideas. one-on-one health coaching with me that has resulted in significant health improvements for many guests. The food is outstanding, and you’ll learn from Shou-Ching herself how to cook great PHD food in 30 minutes a day or less – plus get online access to our cookbook (still in preparation). You’ll get one-on-one posture and movement coaching from our Head of Movement Jae Chung – his sessions have generated rave reviews from nearly everyone – plus 3 movement classes per day including a nightly course in relaxation and stress relief. My science lectures provide depth of understanding and motivation. Plus, it’s fun. You don’t have to take my word for the value of retreats. In recent retreats, nearly all the guests have reported that it exceeded their expectations, and half the guests have been sufficiently delighted to provide video testimonials at the end of the retreat. Soon I’ll start sharing videos from the May 2015 guests. In an ideal world, we would offer the retreats more frequently. The 2015 retreats both sold out two months early, so demand is there. Alas, Shou-Ching and I have taken on another project – curing cancer (more on that later) – which is consuming all our time. Therefore, we’ll only do one retreat in 2016. The 2016 retreat will be held April 30 to May 7, and we’re taking reservations now. The price is going to increase on January 1, but reservations made by December 31 will receive 2015 prices. Also, room selection is in order of reservation – so if you want to come to a retreat, at lower prices than will be available henceforth, and in the best possible room, please consider making your reservation this month. 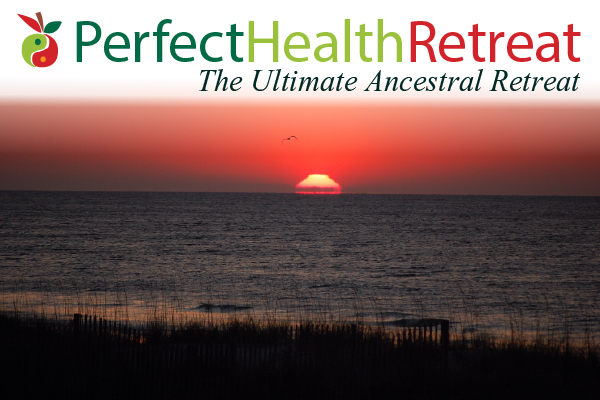 To learn more about the retreat, visit the various web pages under the Perfect Health Retreat tab, starting here. To reserve a room or for more information, please contact Paul Jaminet at paul@perfecthealthretreat.com or Whitney Ross Gray at whitney@perfecthealthretreat.com. One of the benefits retreat guests have enjoyed is free samples of AOBiome’s Mother Dirt AO+Mist skin probiotic. I’ve been using it myself since May and have noticed that consistent use leads to a clearer, younger-looking complexion and the virtual elimination of body odor. There is reason to believe that restoring ammonia-oxidizing bacteria to the skin will increase nitric oxide production; nitric oxide is an important vascular regulator that may lower blood pressure and reduce cardiovascular disease risk. Readers have reported significant improvements in odor, general wellness, and the appearance of skin conditions. Another benefit retreat guests have enjoyed is UBiome gut microbiome sequencing. UBiome is currently offering a 10% discount on their sequencing kits: visit here for details. Darryl Edwards, Paleo from A to Z: A reference guide to better health through nutrition and lifestyle. How to eat, live and thrive as nature intended! I’m sure there were many other great books this year by ancestral authors. If you found something to recommend, please let us know in a comment.